This week's Thursday Drink Night, or TDN, was sponsored by Square One Organic, and their new Square One Botanical was the theme. This spirit is difficult to classify, as it's not really a flavored vodka. I kinda think of it as a gin sans juniper, but this isn't fully correct both for technical reasons about how it is made and because, although it is infused with 8 botanicals, it eschews many of the stronger flavors you typically find in gins for more floral and fruit tones. For the record, those 8 they use are pear, rose, chamomile, lemon verbena, lavender, rosemary, coriander and citrus peel. Oh, and it's organic, right down to the rye used for the grain neutral spirit base. But I don't really care personally about that aspect. I just care that it turned out to be pretty good and people came up with some great drinks using it. Here's my concoction. 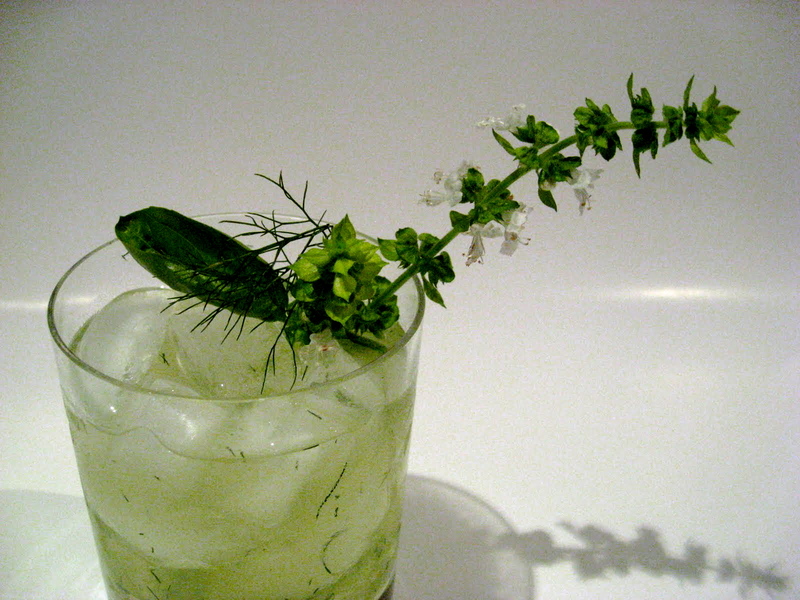 Vigorously muddle fennel and basil with simple, add all rest but soda, stir and strain with julep strainer over rocks, stir again and top with soda; garnish with fresh fennel frond and basil flowers with leaf attached. Use lots of fennel, more than you think you'd need. Keep most of the herbs out with the julep strainer, but let some little pieces of the fronds get through. 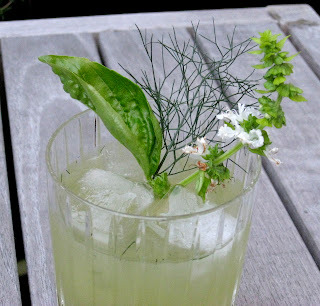 As opposed to some of my other creations where I came up with a name and then made of a cocktail to match, this cocktail was inspired by an idea for a cool garnish, specifically the flowering basil plant in our herb garden. Apparently you are supposed to prune flowers from herbs in any case so the plants continue to direct their energy into leaves and their essential oils rather than going to seed, so this tactic was doubly good. Wanting to add a bit more, I set my gaze upon the nearby fennel plant and it's copious fronds. I figured their fresh hint of anise would add to the complexity of the drink. With the base idea set, I turned to our simple minty friend the Mojito as a reference. 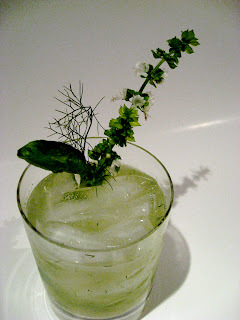 Using this recipe as the base, I swapped my two herbs for the mint and swapped out the rum. I originally crafted the drink using Bulldog Gin, which is light on the juniper and floral like the Botanical. It worked very well, and would have been happy to use it in the drink, but when the theme of TDN was announced I figured the Botanical would work very nicely as well, and it did. So if you can't get Square One products, or you just want a hint of juniper, I certainly encourage you to try a gin like Bulldog which is light on the juniper. A harsher gin I think would wash out the subtle fennel fronds. Even though bitters are optionally called for in the Mojito, I initially wasn't going to use them here, but for a happy accident. When I was playing with the recipe I found I was without the soda, so I used some pretty bad cherry flavored seltzer I had lying around. Trying it with this I thought the cherry flavor might work well when made properly with club soda, thus the cherry bitters addition.